As many of you are probably aware, there is a drive underway this April 1st, for bloggers to unite and donate to the organization Feeding America and Food Banks Canada. April Food Day is asking all those who write blogs and those who read them to donate $1.00 in April. One dollar is such a small amount, yet it equates to ten pounds of food, or seven full meals! If you wish, and are able, you may donate any amount. Please help us fight hunger. 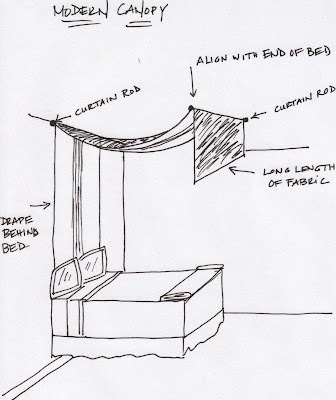 The above drawing is from Blogger Erin at Elements of Style and this is her directions for creating your own Canopy Bed..... "You'll need two drapery rods and a very long length of fabric. If you feel up to it, I like the idea of sewing together a solid on one side and a pattern on the other (for the under side). install one bar right above the head of the bed and one at the foot and run the fabric behind the bed (you can tack it to the wall near the floor so it doesn't move). I think it's a beautiful and cheap way to create a very romantic and dramatic look for your canopy bed." Thanks Erin. 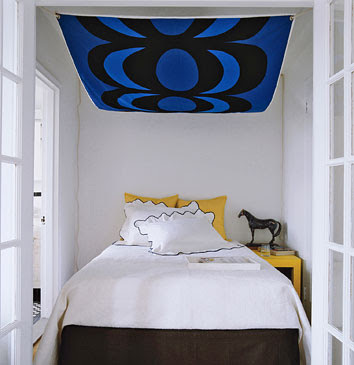 To achieve this DIY Canopy Bed: Screw 4 small hooks in the four corners of the ceiling above the bed and hang a length fabric. 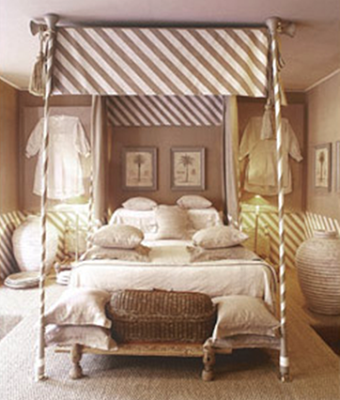 Fancy up plain mosquito netting for a fun & whimsical canopy bed. Ibiza. Even the word has magic. One thinks of beautiful Interior Design and Architecture; of nightclubs that open at dawn; of a night life and a daytime so tightly integrated, one can’t see where the one ends and the other begins. One thinks of royal high-jinks and celebrities avoiding the pesky paparazzi and people so beautiful, when the rest of us look at them, it hurts the eyes. Ibiza is an island and town located in the Mediterranean Sea about 80 km off the coast of Spain. 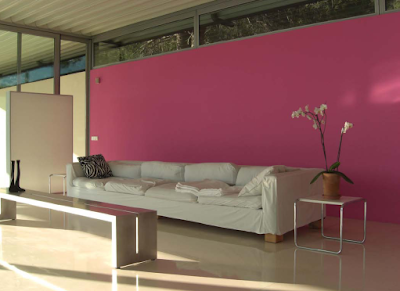 A reader of my blog, recently sent me photos of a house in Ibiza that I fell in love with as soon as I set my eyes on it. 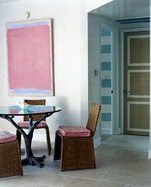 I posted the picture of the living room painted a beautiful pink in my post: Benjamin Moore Virtual Fan Deck. 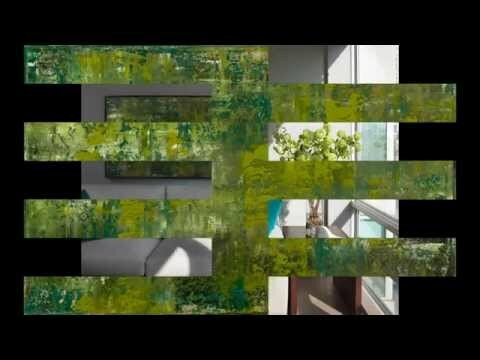 This house is designed by the German architect ERWIEN WACHTER in the architectural style of Mies van der Rohe. It is a 'secret place' not on the public market and is available for rental for 'friends and friends from friends'. If you are interested Contact MONIKA BORCHERT. Enjoy the pictures. Ibiza Interior Design and Architecture I think that this is an amazing design for a front door...and look at the view you have when you enter this home. 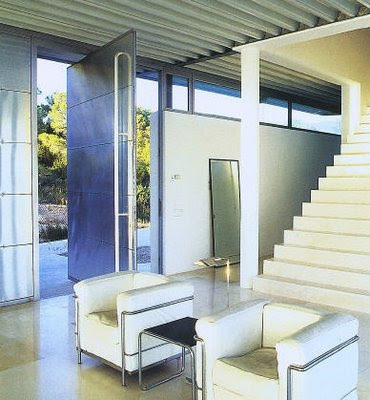 Ibiza Interior Design and Architecture The picture on the right is looking towards the staircase with the front door to the left. 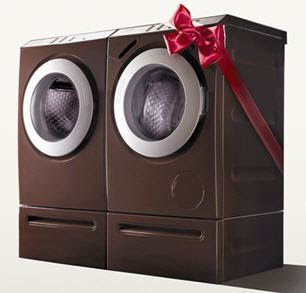 A few weeks ago a package arrived in the mail, and to my surprise when I opened it, there was a box of chocolates in shiny brown wrapping tied with a red satin ribbon accompanied by this photo of the new Miele Limited Edition Chocolate Laundry. This new "Limited Edition" Chocolate Laundry claims a patented honeycomb drum, which is engineered not only to clean clothes better, but also to make clothes last longer by reducing fabric strain and wear. The dryer uses moisture sensors rather than timers. Lucite and acrylic (which is the generic name for this plastic), have become popular materials for furniture,tables, lamps, hardware, trays etc. It is important to clean and care for lucite properly from the start as it is a somewhat delicate material. Proper steps should be exercised in cleaning lucite. 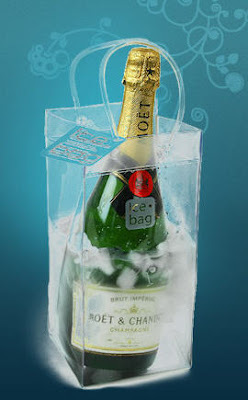 Clean lucite with hot soapy water using a soft cloth. The type of polishing cloth you use will make a difference. 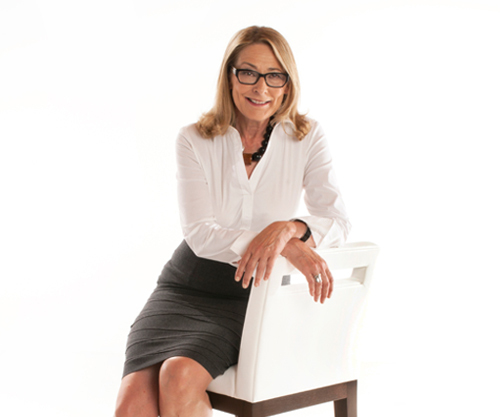 The ideal cloth is nonabrasive, absorbent, and lint free. To eliminate any chance of scratching lucite , use only disposable cloths. Reusable cloths can retain abrasive particles, but you won't know for sure until the damage is done. 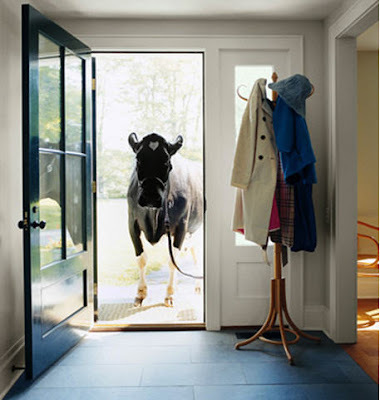 Do not use sprays such as Windex or Fantastic on lucite. This kit from from Novus Polish is great to have on hand. and try not to embarrass myself in the process. 1. My favourite color is yellow and always has been ever since I can remember. 2. I like cotton candy and ballerina flats. I prefer wearing ballerina flats to heels. 3. I I love the Ocean and always thought I couldn't live away from it, that is until I visited Palm Springs. 4. I always carry my passport and 50 Euros in my change purse. That way I'm sure I'm going back. 5. I love dogs - all dogs and especially mine. She is a 4 1/2 pound Yorkshire Terrier named Nicole. 6. I love ironing. Yes strange as it seems I find it relaxing. The Rules: Tag 6 people after you have been tagged. Let 5 people know that you have tagged them. 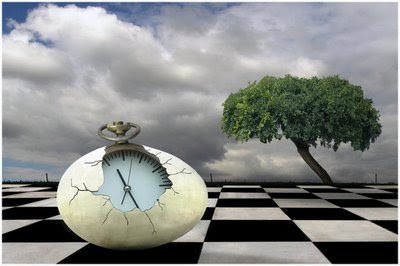 Let the 6th person wander blindly in the wilderness for 40 years, then tell them they have been tagged. These are a few of my favourite pictures from my visit to Palm Springs. The weather was dry and warm. 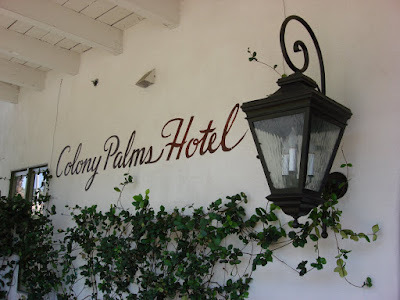 The Moroccan-inspired Colony Palms Hotel is an old landmark in Palm Springs that is a favourite spot for those who 'don't necessarily want to be seen'. It has been on the Condé Nast Traveller Hot List 2008 — 2009. The pool side bar-restaurant Purple Palm is the discrete meeting spot for locals and Hollywood's music and movie-industry elite. A view through the palm to the discreet and trendy poolside Purple Palm bar. Palm Springs Wind Energy - Increasingly popular as alternative sources of energy, wind turbine generators are a type of windmill that produces electricity by harnessing the wind. Wind turbine generators are much less harmful to the environment than burning fossil fuels, but they do require average wind speeds of at least 21 km/h (13 mph). The largest of these windmills stands 150 feet tall with blades half the legend of a football field. Windmill farms on the San Gorgonio Mountain Pass in the San Bernadino Mountains contains more than 4000 separate windmills and provides enough electricity to power Palm Springs and the entire Coachella Valley.